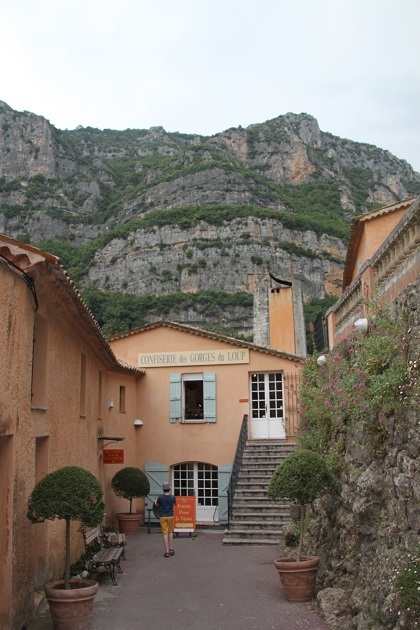 Heading out of Grasse we decided not to return to the coast but to drive into the hills further and explore the Gorges du Loup – first destination being the hilltop village of Gourdon. 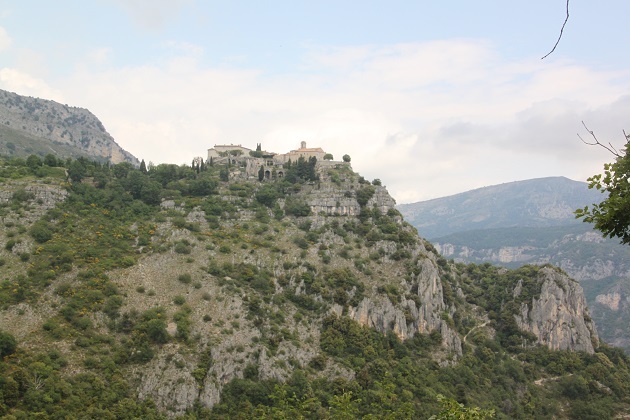 Spectacular scenery, the village is perched atop a cliff with rocky mountains all around. Great views from this little place, we had spectacular vistas of the coast and the valley from 2,500 feet up. 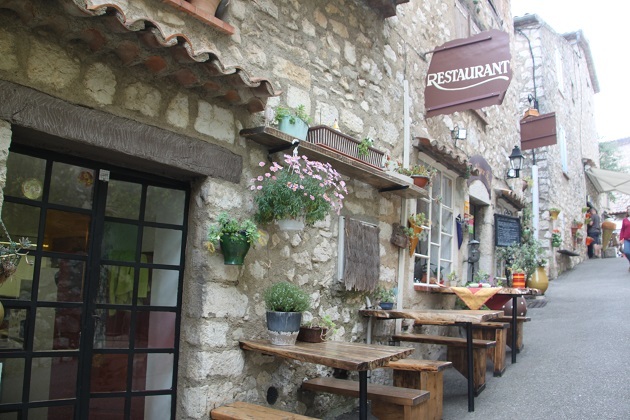 Lots of cobbled streets, stone houses and quaint shops and of course, delicious ice creams. 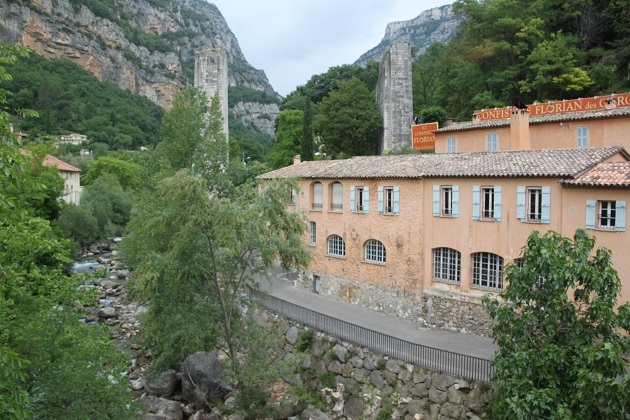 We took a winding road down from the village to Pont sur Loup and found some waterfalls. I had read about a walk to view them which took you through a turnstile and cost 1 Euro – this sounded our kind of thing for sure. 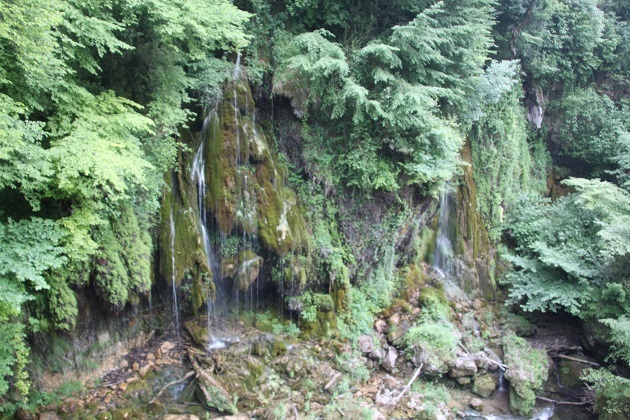 The waterfalls are next to a little restaurant in the middle of nowhere, we parked there, got into suitable walking shoes and set off. Through the turnstile, we duly paid our fees and found about 20 stone steps down to a viewing balcony. It was about 100 paces, not even a stroll and no need for shoes much less special walking ones, still the waterfalls were pretty. 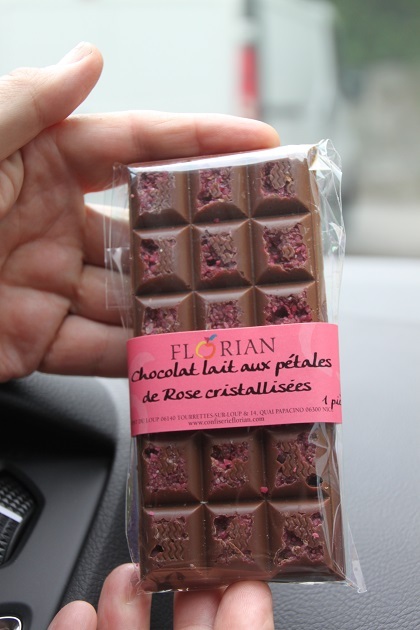 We carried on to Confiserie Florian where, since 1921 they have been turning fruit and flowers into confectionary products – candied fruits, jams, chocolates, fruit and flower flavoured sweets and crystallised flower petals. The location is impressive, right next to a stream with hills in the background and the remains of a railway bridge, bombed during World War II. Tours of the factory are free, however once we got inside the Bank Holiday reared its ugly head again and just like the perfume factory there was no production today and no tours. The lady did though put an English DVD on in the visitor area so we could see the production process and hear more about the company. We made for the little shop, tasted some exquisite rose and violet flavoured jam – so delicious. I would have bought these for sure but transporting jam filled jars on a plane might have proved more than tricky so common sense prevailed. We settled for buying chocolate with rose petals inside – no problem with transporting this on the plane, it was devoured ten minutes after we got into the car. Only regret – we should have bought more. That chocolate looks yummy! 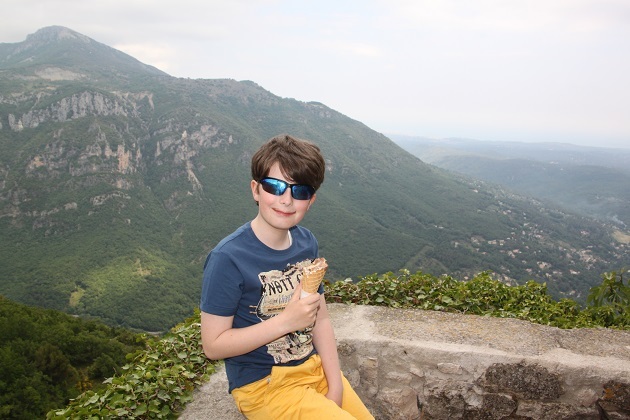 The scenery is beautiful too and it looks like you were enjoying warm, sunny days unlike Wales!! Oh that weather in Wales, this was as far from that as you could get – mostly sunny and hot days with just a smattering of rain once. The chocolate was to die for, never tasted anything like it and I just wish we had stocked up. That bar was gone in the blink of an eye. It is beautiful and we only had an afternoon there so I’m sure with more time there are some other incredible places to visit. We did love what we saw though, maybe some day we’ll get back and see more! 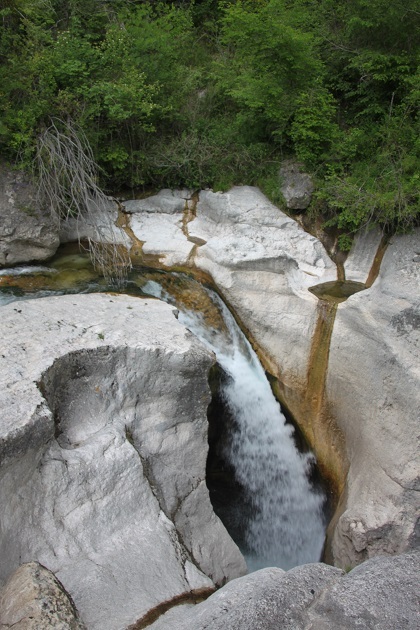 Maybe you can do some rafting around and other water activities. I think it’s famous for that ! That sounds great – my son would be very keen on that for sure! The chocolate was amazing – rose petal flavour, just wish we’d bought a lot more! 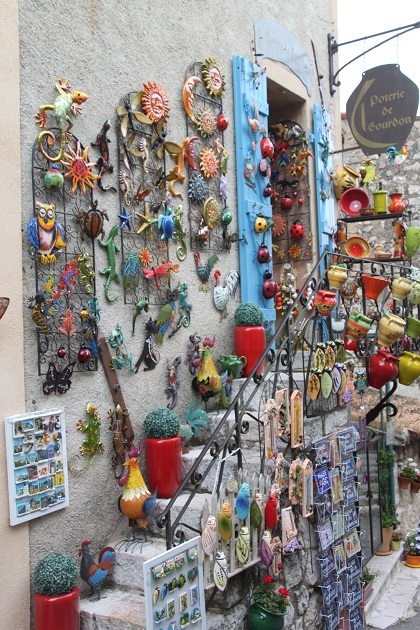 I loved the cobbled roads and quaint shops selling all those knick knacks..
It’s just so quaint and lovely isn’t it – and even though those knick knacks are touristy they are beautiful and the displays are gorgeous. Thanks George – yes this summer he seems to be growing by the day. 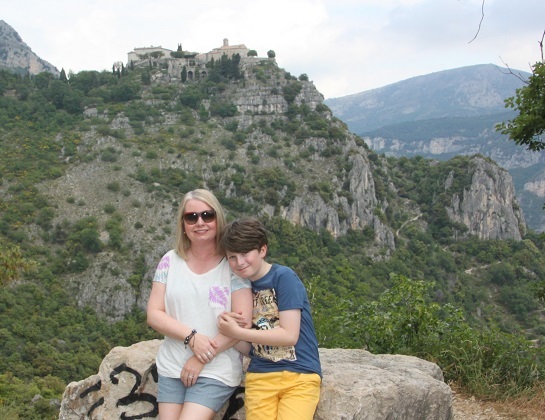 Just about the same height as me now – eek!! What a gorgeous spot. 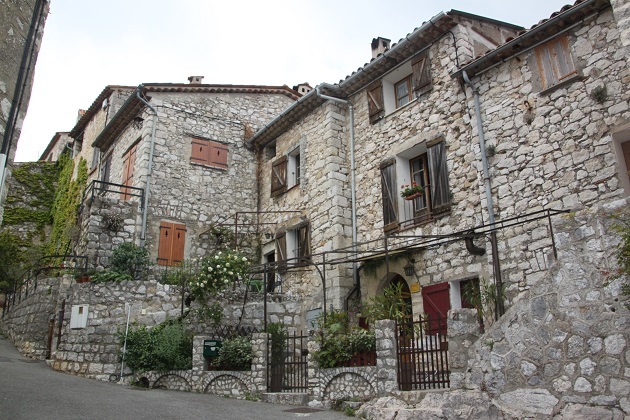 It looks to be so quaint and charming and all nestled in a stunning landscape. You made me chuckle with your preparations for a hike that turned out to be an easy stroll. Luckily we were the only people there – we may have had some peculiar glances if people had seen us get kitted up in walking boots and full gear to go down 10 steps!! It was so delicious, never tasted anything quite like it and I have to say, rose petals and chocolate are a great flavour combination. I like the exposed stonework on the buildings. And it was best to eat the chocolate, it might have melted. Absolutely – that could justify the way it was wolfed down!! Chocolate with rose petals is highly recommended Pam, never tasted anything quite like it before but so delicious! Thank you – it’s a really beautiful place. It is gorgeous, packed with stunning scenery. 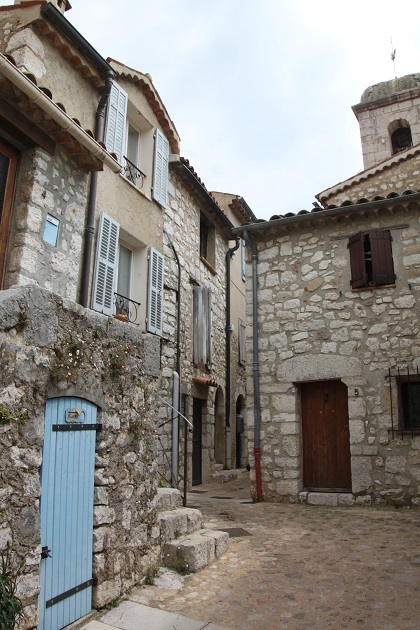 What’s not to love about French villages! 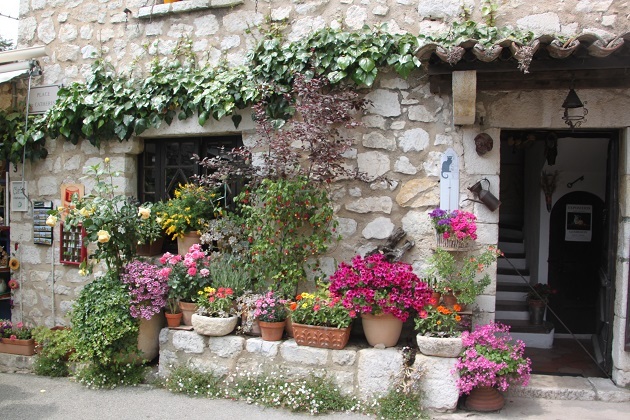 Especially the geraniums and the blue shutters. Absolutely – every little place we passed through was gorgeous. The chocolate – yum – I wish I had bought more!! It was stunning Rosemary, so beautiful and unspoilt. We would have liked the tour of the sweet factory but getting to taste their wonderful produce was really good enough for me. 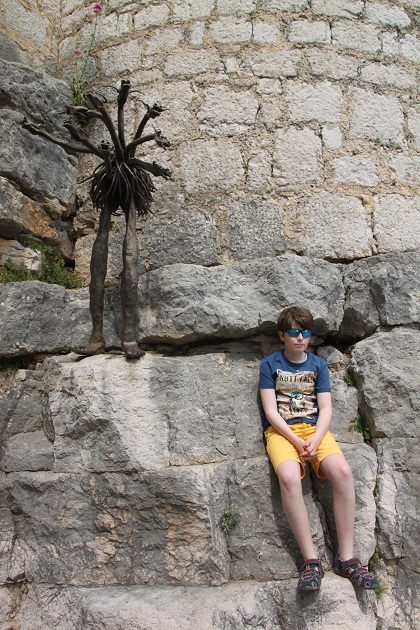 Sun is shining here so we’re enjoying that – making the most of the end of school holidays!! Hope your weekend is great too. It was delicious and yes, he seems to be growing by the day! !